How much will you discount it by? Where will you promote your sale? Will you extend the sale to Cyber Monday too? While plenty of people are still willing to brave the potential hordes of shoppers over the weekend, many more are willing to stay at home and snap up their Black Friday deals online instead. With the increase in traffic and particularly the potential for spikes in activity during the sales period, the strain on your website can quickly begin to show, with the threat of a catastrophic crash looming large over your sales figures. If you haven’t invested in the necessary online infrastructure and stress-tested your site ahead of time, make sure that you do so now. And, if you don’t manage your website yourself, find out who to speak to and how to get hold of them in case the worst happens over the weekend. 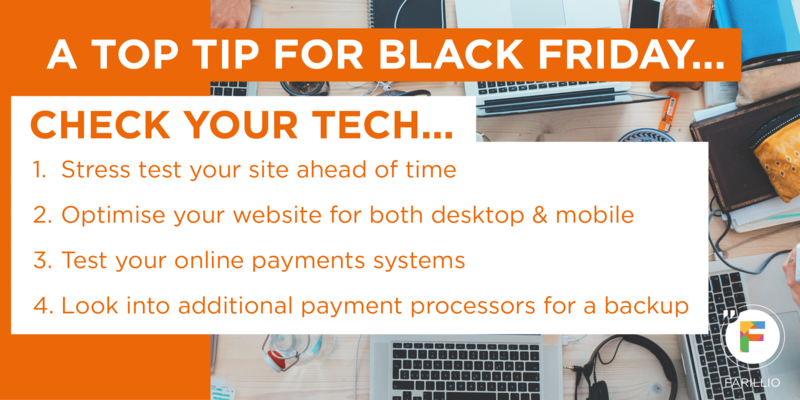 Just as you’ve hopefully put thought into matching your Black Friday marketing and promotions, make sure your web and mobile sites complement each other too. More and more consumers are completing purchases from their mobile devices, meaning it’s more important now than ever that your website is optimised for the mobile experience. That way, your customers can start filling up their basket on their home computer and later, complete their purchase on the move, from their mobile device. It’s not much good having a sale if you find you’re not able to take payments on the day. While making sure you’ve tested your online payments systems as part of the website stress testing mentioned above, you should also look in to providing additional payment processors in case one provider gets in to difficulties over the weekend. If you need some guidance on choosing one that's right for your business' needs, take a look at the guide to payment processing on Farillio. Unless you deliver your products yourself, it’s likely you’ll be using a third party to fulfil those orders. Do your best to keep up to date with delivery guidelines and keep your customers updated too. It may be worth extending your delivery times, or removing the super-fast delivery options during these intensive sales periods to help manage expectations. 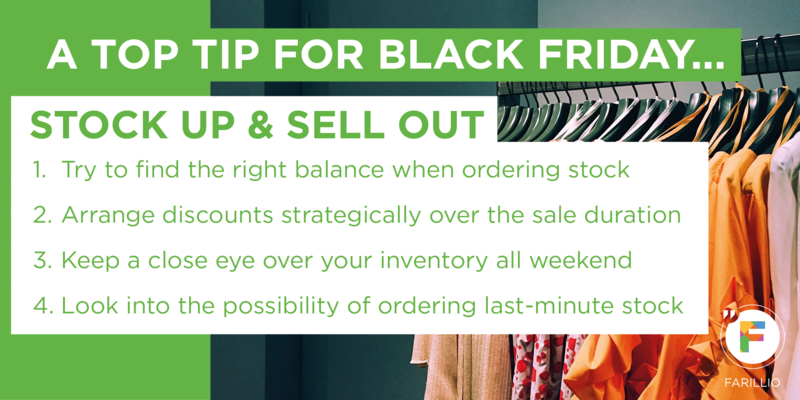 Before going too far down the line with a Black Friday sale, ensure that you have full confidence in the suppliers you're working with. Ideally, you'll have been working with them for a fair while on a variety of order sizes beforehand, so that you know you can trust them to provide you with high-quality products and/or services at even the busiest of times. 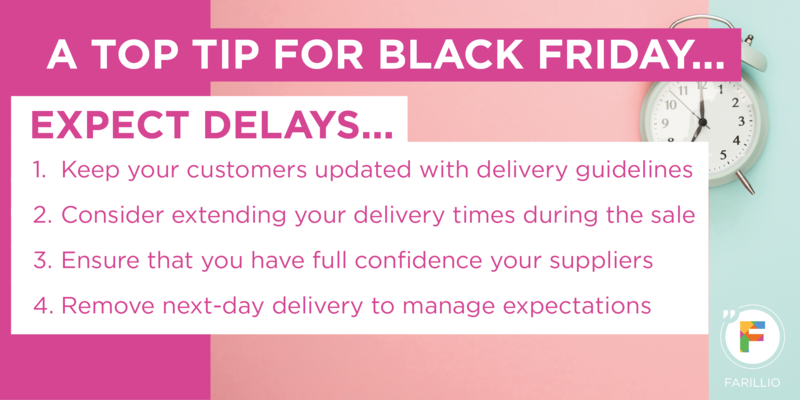 If during the sale, you find your suppliers aren't working quite in the way you'd thought they would – firstly, stay calm. It’s much more important in the short term to solve the problem and in the long term, maintain your relationship. You can be prepared by knowing in advance who’s responsible in the event of a failure to deliver to you fully or on time. If someone else can supply the same goods or services to you, explore starting a new relationship there. However, be wary not to put all your eggs in to another new basket, particularly if there’s no pre-existing relationship or if they're a new business. If possible, and time allows, place a small order first. It’s no good upgrading your site and investing in your inventory if you then can’t physically cope with the demand. And, in the past, some big businesses have struggled to provide their usual standards of customer service in the face of an uptick in sales. Increased demand means more enquiries, more orders, but, unfortunately, potentially more complaints. This is particularly true at this time of year, where shopping can be just that little bit more stressful. But, hopefully, you’ve already got a great team of people who know your products and services and can answer most questions as a result. If not, it may be worth putting some time aside to do a little extra training to bring everyone up to speed. Simple: hire more staff – but alas, it’s not that simple. Good help is hard to find at the best of times, let alone during the seasonal peak periods. But there are some easy ways you can make it faster and cheaper – getting in touch with old members of staff to see if they can come back and give you a hand again, asking for referrals from your current team or branching out into your social media network and looking for help that way. Most importantly though, make sure you set up the proper procedures for your new team members, make them feel welcome and comfortable and give them all the training they need to do what you ask them to. And remember, before you hire anyone as an employee, check that it's the best thing for your business – as perhaps hiring a worker or a self-employed contractor would be better. To help you work out what's best for your situation, take a look at our guide: Can you afford to employ help? And don't forget: keep morale up throughout the weekend to help your team stay motivated and positive during this busy season! Hopefully if you’ve followed our advice up to now, you should already be in a better position to protect yourself from acts of crime. But there’s no harm in looking at how we can reduce those risks further. Fraud is a huge risk for SMEs, and you've always got to be vigilant. Teach your supplier and customer-facing staff to be able to identify the red flags. Find out about your bank and payment processor’s security promises, and what processes they have in place to support you in the event that you’re a victim of fraud. Think twice if something doesn’t look right – and remember: if it seems too good to be true, it probably is. Cyber criminals will often try to attack websites that don’t have the proper security in place, to try and steal your customer’s personal information or disable your website. Many small businesses make the same mistake of assuming they don’t need to worry about falling victim to this kind of crime, (take a look at our guide to cyber crime to find out what to look out for) but, if your security credentials aren’t up to scratch, you not only risk your customer’s sensitive data and their good faith in your business, but also a hefty fine from the Information Commissioners Office, if it can be shown you have been wilfully negligent of your obligations under the GDPR. One reason for increased instances of crime around this time is that businesses are more vulnerable when they are at their busiest and most stressed. Keep your guard up. 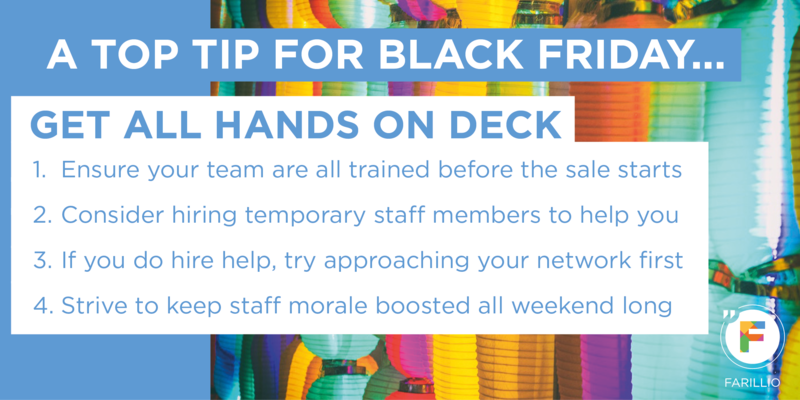 Make sure all staff, old and new, have been fully briefed when it comes to your security procedures and review said procedures ahead of the sales weekend. If applicable, check your stores, warehouses, vehicles and anything else that could be seen as a soft target. It’s better to take the time to do it now and not have needed to than to not take the time and later wish you had done. 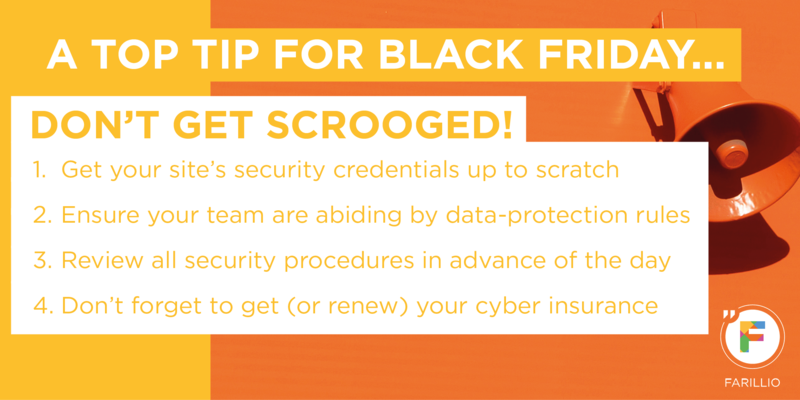 When it comes to holiday sales, slashed prices and queues out the door, your customers will already know that some items won’t hang around forever. That said, they may not always be so understanding... particularly if they’ve purchased goods that you later find not to have in stock or are unable to deliver quickly. Minimise the negative impacts of running out of stock on the day by keeping a close eye over your product lines, particularly those that have been a part of your sales promotions. You can make this task easier for yourself, by arranging your discounts to start and end strategically over the course of the weekend. This has the added benefit of helping to reduce some of the pressure on your systems and logistics by managing certain areas of demand. And look into the possibility of ordering more stock last minute, just in case you do need to restock in a hurry due to a successful sale! Of course, the other side of the coin is that you pile goods high but sales aren’t quite what you’ve been expecting. For example, if you were to buy 200 units of the product you're most confident in but only make 10 sales over the Black Friday weekend, you'll have a large amount of surplus stock that you may find tricky to sell at full price...meaning the sale would actually cost you more than you make from it! Of course, it's near impossible to estimate the exact number of sales you're going to make – but if you have a good sales strategy; it's certainly possible to strike the right balance between having too much and not enough stock. With our advice and some thoughtful preparation, these pitfalls can all be avoided, leaving you to concentrate on having a successful sale rather than a disastrous one! Create your own Farillio account today for access to all of the guides mentioned in this blog, in addition to 100s of multimedia guides, interactive templates, video tutorials, and more to help you not only get Black Friday ready, but ready for practically any business scenario!